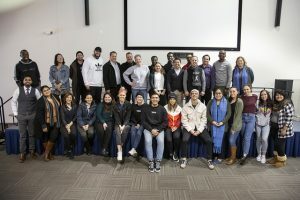 (Washington, DC) — WGTS 91.9 management invited Elevation Worship to the station for a time of praise and encouragement for the staff of the station. With songs like “Do It Again” and “Come to the Altar”, the members of Elevation Worship celebrated what God is doing at the station. Chris Brown of Elevation Worship pointed out that the station is the one actually doing the inviting to the altar of Christ. Josh Lauritch of 55Promotions shared his personal testimony and prompted the staff to seek Jesus first. WGTS 91.9 President/General Manager Kevin Krueger wrapped up the event with words of encouragement for the staff that included reciting the entire WGTS 91.9 mission statement and a reminder that we serve God first.